Labor can make you feel like your bottom has gone fifteen rounds with a prizefighter and run the NY Marathon – all at once. When the simple act of sitting isn't simple at all, Postpartum Bath Herbs is a heap of help for your heinie. 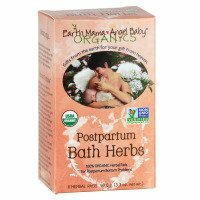 USDA Certified Organic, Non-GMO Project Verified Postpartum Bath Herbs is a soothing, comforting blend of wound healing, styptic and antibacterial herbs that have traditionally been used to support postpartum women to help reduce swelling and speed healing of vaginal soreness, tears, episiotomy and perineal bruising. Great for prenatal and postpartum hemorrhoids too. Packed in easy to use, individual herbal pads, each is perfect for one use, without the soggy herb cleanup! Directly after childbirth and for several days, use the moistened herbal pads iced to comfort achy mama parts. Later, use them warm, or in a sitz bath, for soothing relief. Feel better and “sitz” easier, so you can enjoy your new angel, naturally.